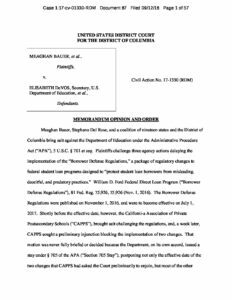 On July 6, 2017, two student borrowers represented by the Project on Predatory Student Lending and Public Citizen filed a lawsuit against the Secretary of Education for illegally delaying borrower defense rules intended to protect borrowers’ rights. On September 12, 2018, a judge ruled that these delays were illegal. This is a major victory for student borrowers and for anyone who cares about having a government that operates under the rule of law, instead of as a pawn of the for-profit college industry. The 2016 borrower defense rule imposed critical protections for students, including banning forced arbitration policies that had stacked the deck in favor of predatory for-profit colleges. Today’s ruling clearly states that the Department’s efforts to thwart those protections were illegal and had no basis in fact or the law. Click here to learn more about Bauer v. Devos.